Labor Day is fast approaching, so although it seems untimely to present you with picnic recipes at the onset of fall, hopefully you plan on savoring the last of summer’s sticky heat with a picnic. Or, maybe you’re lucky enough to have perfect mild (high 60’s/low 70’s is ideal for me) and not swampy weather. Either way, I’ve put together a few picnic menus you can use as a one-stop shop for your Labor Day (or any day) picnic planning. Each main course plus the listed side(s) should be plenty filling, even more so if friends and family are joining in the fun and bringing more dips, sides, or appetizers. All the components or finished dishes will do well wrapped or stored in air tight plastic bags or containers, placed in a cooler with ice or ice packs. I’ve also been fascinated lately by Molly’s couple posts which showcase a handy two-sided hot and cold food thermos. I didn’t include any hot items here, but I’m sure you could come up with something to fit the bill (like cauliflower Swiss soup or maple bacon polenta, which I would do sans bacon and plus cheese). Make sure you don’t forget drinks, either! Being the trendy conformist that I am (NOT), my current preference is simple: rosé all the freakin’ way. 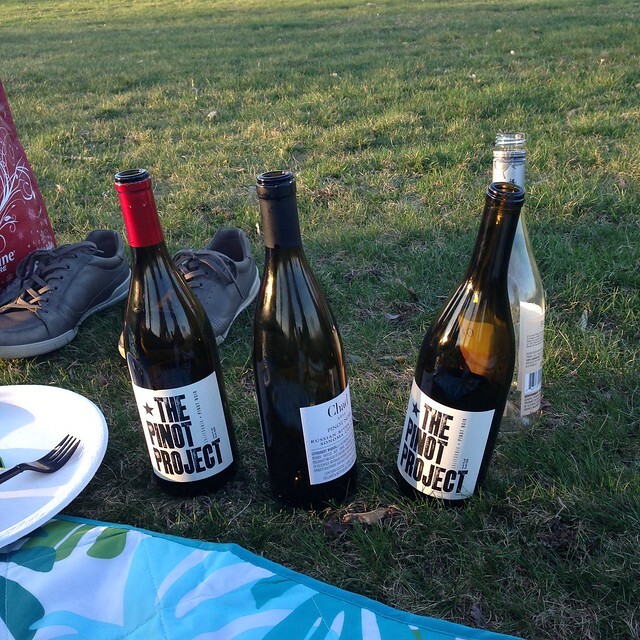 Sure, fancy cocktails are awesome, but I like it better when others contribute them so I can fully focus on food preparation and our picnic spread. Have you ever been judged as overly basic for bringing “just” a bottle of wine, instead of some jalapeño infused watermelon tequila spritz? I didn’t think so. And if you have, you might reconsider your company. Or just up the number of bottles. 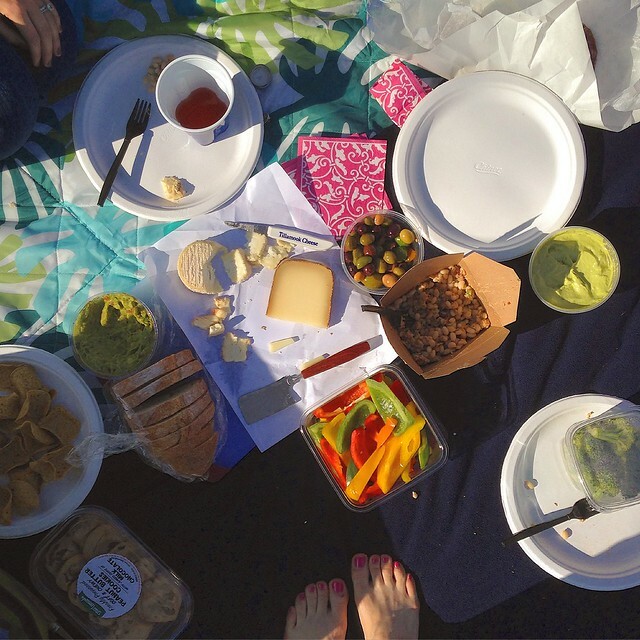 If you’re inexperienced with outdoor eating spreads, let’s also talk “apps” for a minute. All of these menus are relatively light and simple fare, so you can go heavy on pre-lunch snacks like olives, cheese, or nuts. Really, it’s that simple. Two sentence appetizer discussion is now over and off to picnic planning you go! 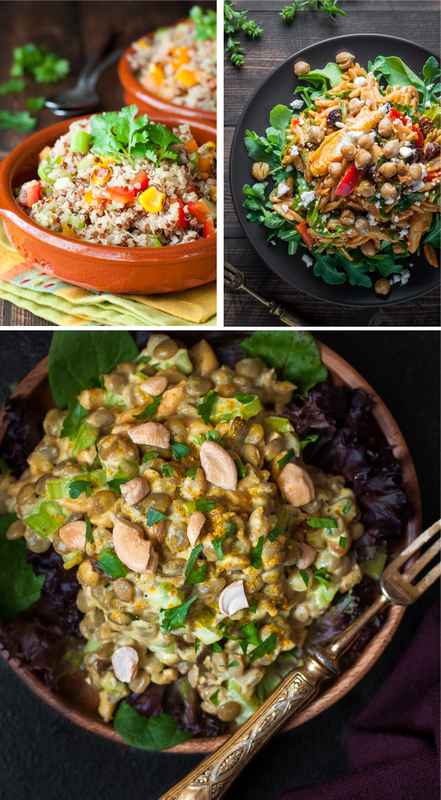 Get the recipe for curried lentil salad here. 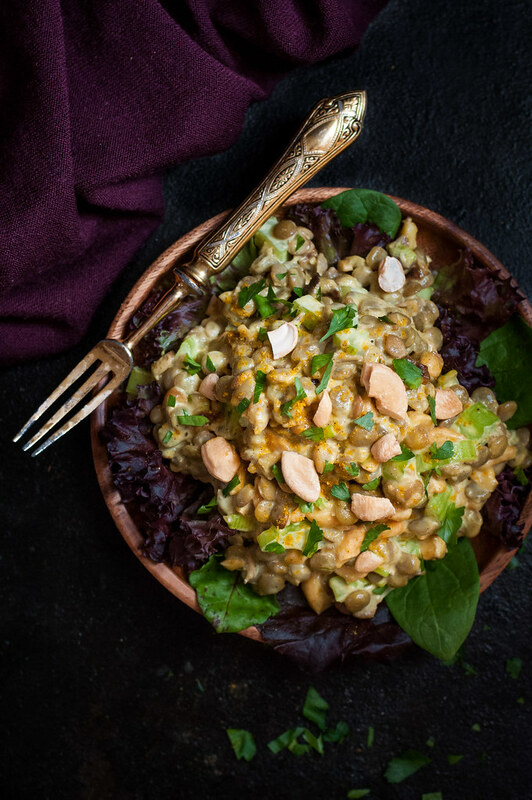 The best part about this Indian-inspired, refreshing dressing is that it’s chock full of wine! And, of course, my favorite lentils. Don’t worry, the recipe provides an alternate if you don’t want to use vino. Pack the salad in a wrap with a bit of your favorite greens, or, if you’re watching your grains or gluten, use brown rice tortillas (although, honestly, they can be a little stiff to fold) or just pack up big containers of salad to eat with a spoon. The salad stands alone quite well, eliminating the need to pack your wraps with a million veggie toppings and condiments. Serve it with: Another salad! Combine romaine, tomatoes, cucumbers, and some parmesan and when you arrive at your picnic, shake it up with a basic red wine vinaigrette. Pack the vinaigrette separately (in a mason jar, if you want to be extra cute). My basic vinaigrette formula is 1 part red wine vinegar, 2 to 3 parts oil, salt, pepper, plus any of the following you want to throw in: minced red onion or shallot, herbs, minced or crushed garlic, dijon mustard, and maple syrup for just a touch of sweet to cut the vinegar. 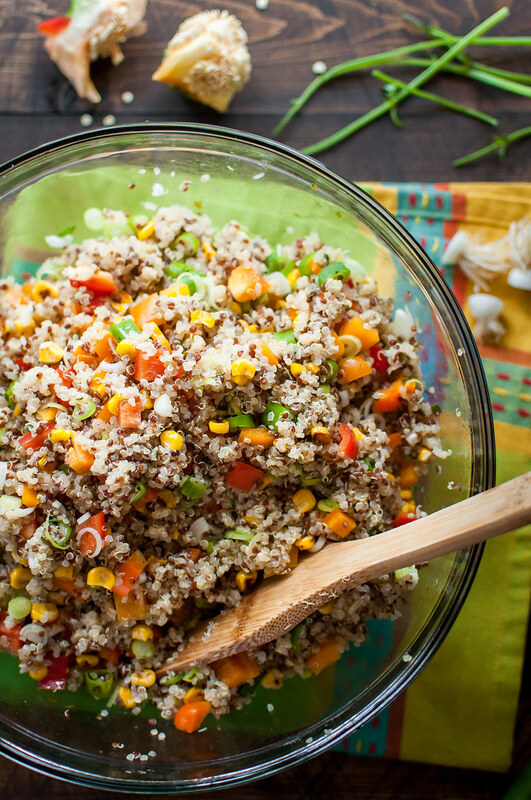 Southwest quinoa salad with lime vinaigrette is an awesome salad recipe to make in large quantities: It’s cost-effective and fast, with lots of fresh, crunchy veggies. Know what that means? Yep, veggies that just need chopping, not cooking, saving your precious time. The lime vinaigrette is equally quick and flavorful, with fresh cilantro and spices that get tossed right in. Using raw spices can be risky (if you use too much), but this recipe nails it, and the flavors are pleasantly strong but not overpowering. It soaks into the warm quinoa, infusing the grain (technically, seed) with tangy lime and southwest flavah. 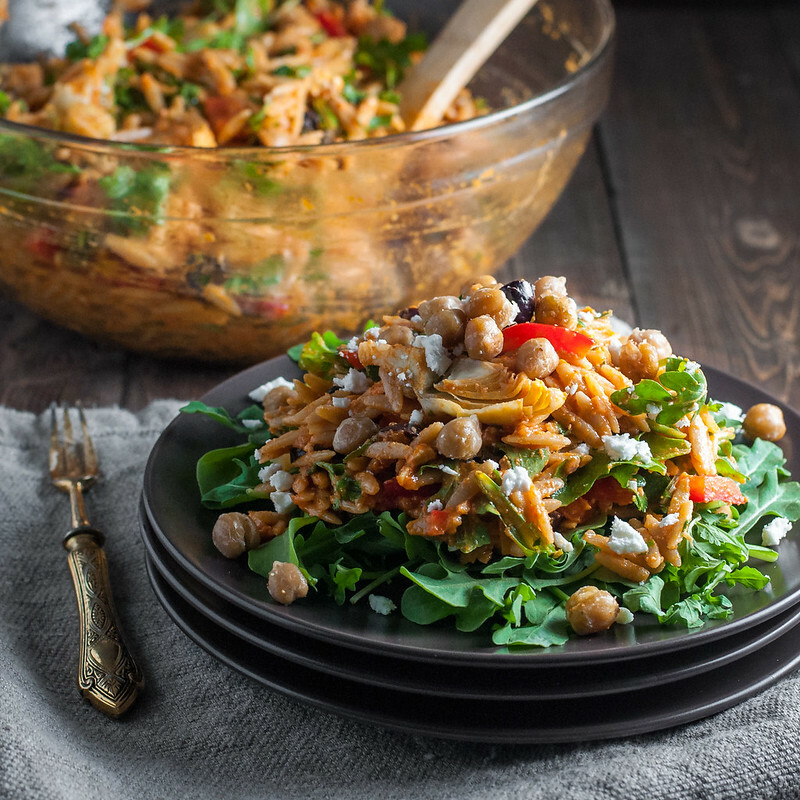 Antipasto orzo salad with garlic roasted chickpeas might look fancy, but it’s just as easy to serve at a picnic as it is on a hot date night in. Omit the loose arugula that the pasta salad is serve atop, and if you’re really crunched for time, use plain, canned chickpeas instead of roasting them. The real draw of this pasta salad is the creamy, yet vegan, fresh tomato dressing, that’s every bit as addictive as most mayo-based pasta salad dressing. If you have fun plans for the last days of summer, especially if they involve packing a picnic, I’d love to hear about them below in the comments. It’s quite possible that instead of picnicking, I’ll be continuing wedding planning. Oh, and watching wiener dog races. I’m still in Minnesota, and Mom let it be known that a day at the races is at the top of her Labor Day to do list. Expect a temporary lapse in my food-centric Insta feed for dachshund videos if this event comes to pass. Note: This page contains affiliate links. It does NOT contain sponsored content. 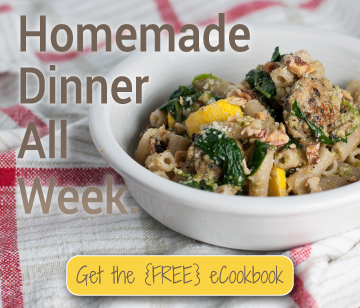 Affiliate links (to products I recommend, on Amazon) offset my ingredient and website maintenance costs, so I can keep bringing you _______ recipes like this one. Thanks!